Fans of the Full Irish Breakfast will be delighted to learn that one of its key and most delicious ingredients, Black Pudding (or ‘blood sausage’), has been named as a so-called ‘superfood’. Black Pudding is absolutely packed with superfood nutrients as well as plenty of calcium, protein, zinc, iron and magnesium, all of which are necessary to good health. As an additional bonus, it is particularly low in the rather less desirable carbohydrates, and thus is a great addition to a Full Irish Breakfast. Blood sausage, as the name implies, is generally made from a combination of pig’s blood, beef suet or pork fat, onion, oatmeal, spices and a generous twist of salt and pepper. Non-meat eaters can take solace in the fact that a vegetarian version can be made by substituting the suet and pig’s blood with a combination of mushrooms and black beans. Butchers in Ireland have noted an increasing demand for blood sausage over recent years – and this demand is bound to be boosted now that it has been recognised by some in the industry as a foodstuff that is beneficial to health. Healthy eating is an increasing preoccupation of many people in Ireland, as it is across much of Europe. 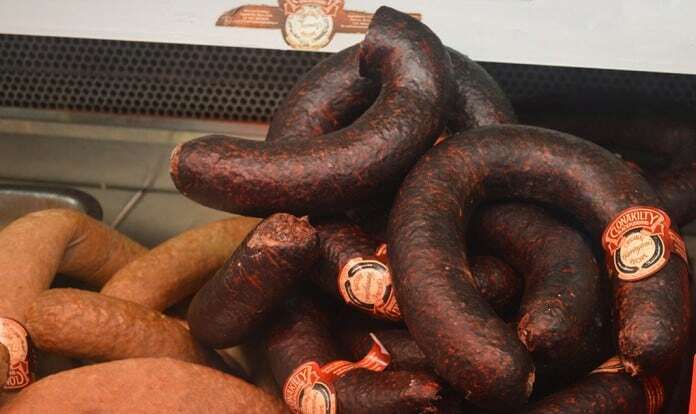 While other popular Irish foods have recently been highlighted as ‘superfoods’, including seaweed and black beans, the unveiling of blood sausage on the list did come as a surprise. While there is no doubt that blood sausage contains some healthy ingredients, there is some cynicism among nutritionists about applying the ‘super’ label to food. This opinion has been echoed by EU legislation, which bans the printing of such health claims on food packaging unless it has been scientifically proved to its satisfaction. There’s no doubt, though, that despite the scepticism of many experts, this is a trend that is here to stay, as people try to do all they can to reduce their risk of illnesses such as heart disease, stroke and cancer. Although it makes sense to approach claims about the benefits of any one product with caution, that is not to say we should dismiss them entirely. While it would be short-sighted to believe claims of wonder-foods that can cure all ills, eating a balanced diet is key to good health, and the constituent elements of blood sausage do seem to fit in well with this. Ultimately, eating plenty of vegetables and fruit, plus some wholegrains and healthy fats, is held up as the ideal by most nutritionists, and blood sausage certainly does tick some of these boxes. One of the best ways to incorporate some blood sausage into your food planning is to treat yourself to a hearty and traditional Irish breakfast. This traditional meal is beloved by many on the Emerald Isle, and the delicious cooking smells serve to evoke happy memories from childhood. It is definitely worth putting the effort into the getting all the separate components right – the results really are worth the trouble! Firstly, you will need some Irish link sausages. These can be pork or beef and should ideally be encased in the classic pig intestine. These can be fried, grilled or cooked in the oven, depending on your personal preference. Make sure they are golden brown and slightly crispy. The next key ingredient will be some rashers of good Irish bacon. The very best bacon can be sourced from a butcher, who will have cut it fresh from the loin before soaking it. Streaky bacon also works well. As with the sausages, this should be cooked until sizzling. Now it’s time for our star ingredient – blood sausage. This should be sliced and fried until nice and crispy (you can also cook it in the oven if you prefer). No Irish breakfast would be complete without the addition of some delicious free-range eggs, either scrambled or fried, plus a generous helping of baked beans, tomatoes and mushrooms. Some griddled bread is another essential part of any cooked Irish breakfast. This can be in the form of either soda farls (soda bread) potato farls (made from potatoes, salt and flour) or boxty (a pancake-like potato-based bread). Whichever one you opt for, slice it thickly and fry until it is golden. Many people also like to have some brown bread smothered with lashings of butter and either marmalade and jam on the side. 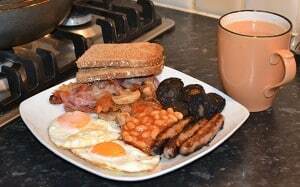 The best (and some would say only) way to wash down this amazing Full Irish Breakfast – complete with a moreish helping of new ‘superfood’ black pudding – is with a large and steaming mug of good strong tea, fresh from the pot. While the traditional Full Irish Breakfast is certainly a classic way to incorporate some black pudding into your diet, there are plenty of other dishes that are heightened by its addition. If you want to mix it up a bit, you could also consider using it as a pizza topping. Combined with goat’s cheese, the result is a true superfood showstopper!